Last night, planet Earth rumbled in a place where it usually doesn’t rumble: Montana. But it also rumbled in the Philippines. Come to think of it, it rumbled in Vanuatu and Japan too. The Earth rumbles a lot. Folks were especially surprised by the earthquake with a magnitude of 5.8 in Montana. Why? Well, we’re America, and weird stuff that happens to us tends to make news. But more importantly, it is kind of strange for an earthquake to happen in Western Montana. It’s not unheard of, but this was the strongest earthquake in the area in over 20 years. Earthquakes are frequently the result of the crust moving along faults, cracks where different pieces of crust meet, though they can also come from volcanos or stresses in the Earth from injecting wastewater. The Montana earthquake happened along the Rocky Mountain range, a place where, historically, there’s been a lot of motion in the Earth. That’s how mountains form, after all. But more commonly, earthquakes occur at the boundaries between moving tectonic plates on which the continents sit. The plates sit atop the solid-but-jiggly mantle. Places where these plates meet, including California, Alaska, Japan, and the Philippines, see earthquakes more frequently. So, while folks were complaining about drinks falling off of counters in Montana, a stronger earthquake hit the Philippines, registering a magnitude of 6.5, knocking over a building and killing at least one confirmed person. Actually, there were 36 earthquakes stronger than a magnitude of 2.5 in the past 24 hours (though some of those seem to be related to the Montana quake), according to the USGS. 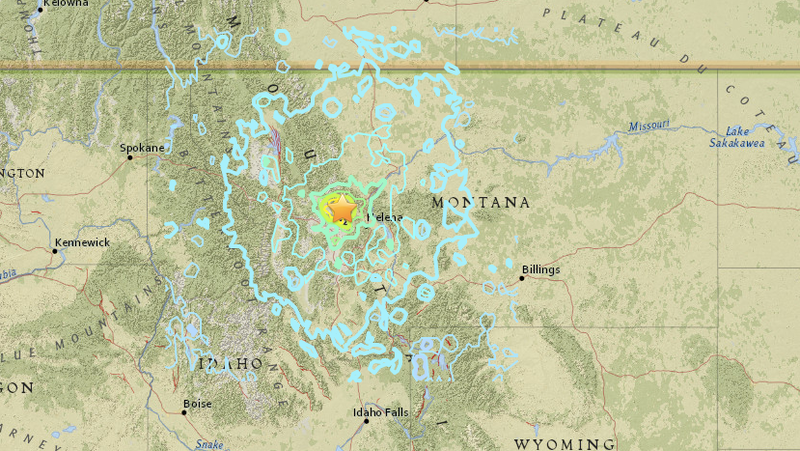 Did something nefarious (like humankind) cause this Montana quake? After all, there have been an increasing number of quakes in Oklahoma, in part due to wastewater injected into the ground from oil operations (there were two small earthquakes in Oklahoma last night, by the way). It’s unlikely in this case, said Sanders, since Montana oil operations mostly take place in the eastern part of the state. As for the exact physics of this quake, it will be a while before scientists get to crunching the data, said Sanders. The earth quakes. It quakes a lot. If you don’t like it, blame your parents for giving birth to you on a rumbling planet. Correction: UCLA Ph.D Candidate Sean Ahdi pointed out to us that the USGS uses the moment magnitude scale, not the outdated Richter scale, to measure earthquakes. We have updated the post and regret the error.